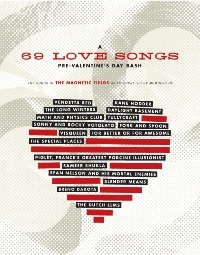 69 Love Songs Pre-Valentine's Day Bash! Seattle, WA, January 20, 2006 — "We're Absolutely Cuckoo" for The Magnetic Fields. That's why Three Imaginary Girls has decided to celebrate Valentine's Day this year with a 69 Love Songs Pre-Valentine's Day Bash, co-sponsored by the mighty 90.3 KEXP and the amazing Barsuk Records. The event will take place at the Crocodile Café on Thursday night, February 9th, and will feature collaborations from tons of Northwest musicians performing their favorite tracks from the 1999 Magnetic Field's 3-disc opus, 69 Love Songs. Lovebirds Eric Corson (The Long Winters) and Anna Lange (Dutch Elms) will debut their lo-fi side project, Fork and Spoon. Newlyweds Andrew Moore (Kane Hodder) and Alissabeth Newton (ex-The Catch) will perform as their aptly named band, For Better Or For Awesome. Rock and roll brothers Rocky Votolato (formerly of Waxwing) and Sonny Votolato (Slender Means) will dazzle the crowd with their amazingly talented genes. The outrageous Adrian Lefleur of Iron Composer fame (coming soon to the Game Show Network) will emcee the event and will raffle off a variety of fabulous indie-rock themed prize packs throughout the night. "Since Stephin Merritt rarely tours, we figured the next best thing would be to have a bunch of our favorite bands cover the songs. I am giddy with anticipation," said Liz Riley, co-founder of Three Imaginary Girls. Three Imaginary Girls will also run a "Tell Us Your 69 Love Songs Love Story" themed-contest. Readers can submit their stories of how 69 Love Songs impacted their love lives, and the best submission will receive a pair of free tickets to the show. The imaginary girls will read the best stories between sets throughout the night. "The crazy thing about 69 Love Songs is that no matter where you are romantically, it's fitting," Dana Bos, also a co-founder. "You can rejoice, court, break-up, kiss, wed, laugh, fight, or drink with that album." "I can't wait to hear who sings 'Underwear,'" said imaginary girl Char. "I hope he changes the lyrics to 'A pretty imaginary girl, in her underwear.'" If there's anything better in this world — who cares? WHAT: Three Imaginary Girls 69 Love Songs Pre-Valentine's Day Bash. Co-sponsored by 90.3 KEXP and Barsuk Records. WHEN: Thursday, February 9, 2006. Doors open 8p. 21+. COST: $7. Advance tickets available through Ticketweb. 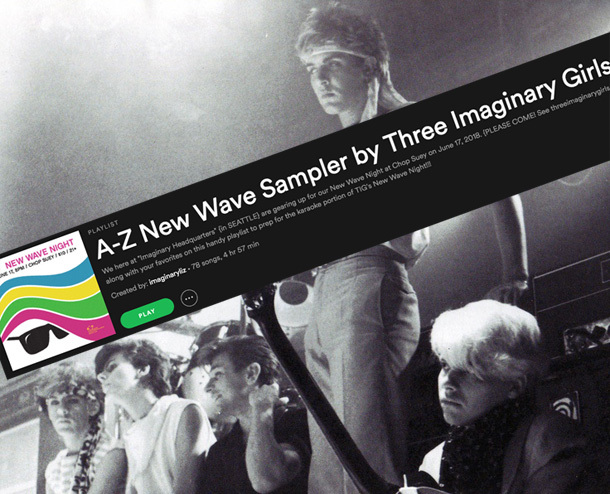 ThreeImaginaryGirls.com is a Seattle-based website that showcases the great music of the Northwest to music lovers worldwide. During the past three+ years, the site has featured reviews of albums, live music, film, theater, interviews, political commentary, and even love advice, in Seattle and beyond. The girls also book music showcases, contribute to other music publications (including The Stranger, Tablet Magazine, and Music for America), and make guest radio appearances on 90.3 KEXP. The girls were voted "MVP of Seattle Music 2004" by readers of the Seattle Weekly, and were listed in Seattle Magazine's Most Influential People issue. Intrigued? For more information, contact: [email protected]. KEXP 90.3 FM is a public radio station in Seattle with a mission to enrich people's lives with a unique wide and deep approach to music programming. Knowledgeable hosts hand-pick music including indie rock, world music, blues, jazz, hip hop and electronic from its collection of approximately 500,000 titles. The station also broadcasts more than 250 live performances each year. KEXP programming is also heard on the web at KEXP.org. KEXP 90.3 FM is governed by Friends of KEXP, an independent non-profit organization with an agreement to operate 90.3 FM on behalf of the University of Washington which holds the FCC license. Founded in the late '90s by friends and band mates Josh Rosenfeld and Christopher Possanza as a way to put out music by their own band (This Busy Monster) and their friends' bands (including Death Cab for Cutie, Little Champions, Abigail Grush), Barsuk Records has grown and flourished over the years. Focused not on any specific genre, but simply on supporting quality songwriting and unique creativity, Barsuk has helped introduce the world to such phenomenally talented artists as The Long Winters, Jesse Sykes & The Sweet Hereafter, Aqueduct, John Vanderslice, Rilo Kiley, and Nada Surf. Barsuk Records continues to expand its roster into 2006 (with upcoming releases from Rocky Votolato, Mates of State, Starlight Mints and Viva Voce), and promises to be a bastion of quality music for years to come.